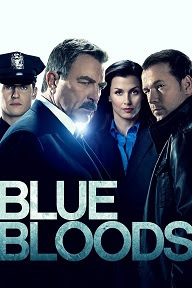 Starting tonight (Wednesday, January 3) at 20h00 on M-Net Channel 101 will be Season 8 of the acclaimed, Emmy-nominated crime drama, Blue Bloods. Tom Selleck stars as Frank Reagan, the New York Police Commissioner, and patriarch of the Reagan clan, a multigenerational family of cops. Frank's oldest son is Danny (Donnie Wahlberg), a seasoned detective and Iraqi War veteran who occasionally uses dubious tactics to solve cases. Daughter Erin (Bridget Moynahan), the lone female, is an assistant district attorney. Fresh out of Harvard Law, Jamie (Will Estes) is the youngest member and "golden boy" of the family. Jamie gave up a lucrative future in law to continue the family's tradition in police work, and is asked to participate in a secretive investigation that even his father does not know about. Len Cariou plays Reagan’s father. In the season premiere, Cutting Losses, Danny contemplates retiring until Erin enlists him to help her with a case involving her ex-husband.